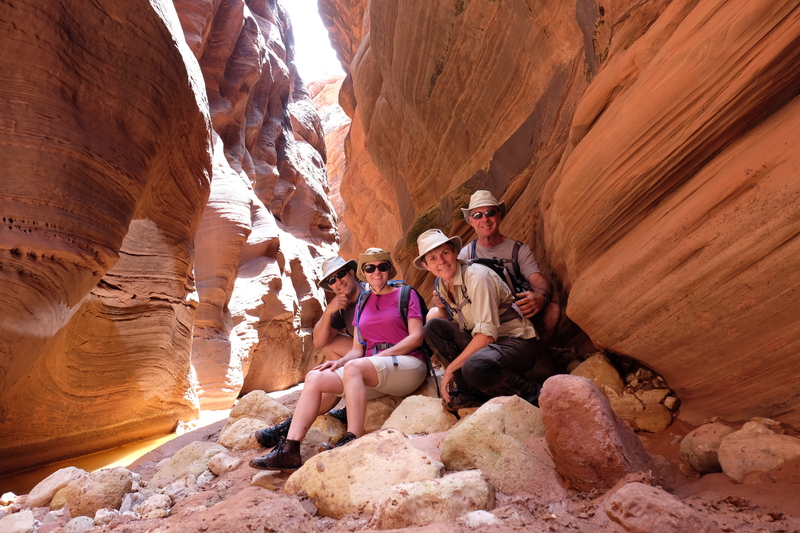 We take a break for a photo after stopping to eat lunch mid-way through our exploration of Buckskin Gulch. Traveling north last month from the Overland Expo in Flagstaff, Arizona with Bill, and our friends Chris and Laura Moxley, we had camped at Coyote Loco in the Kaibab National Forest and hiked in the Grand Canyon. 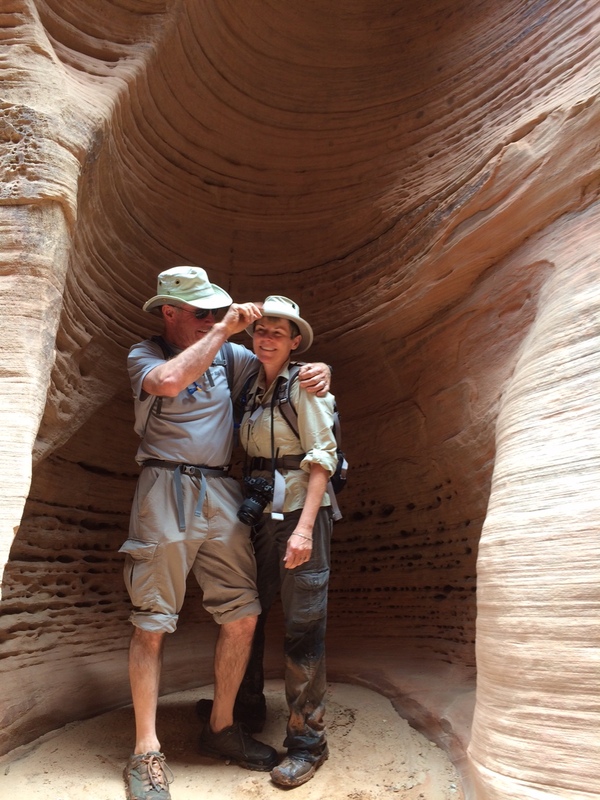 The night before our Buckskin Gulch hike, we camped in Vermilion Cliffs, not far from the Wire Pass Trailhead for the Gulch. Our first surprise on the morning of the hike was the number of people in the canyon. 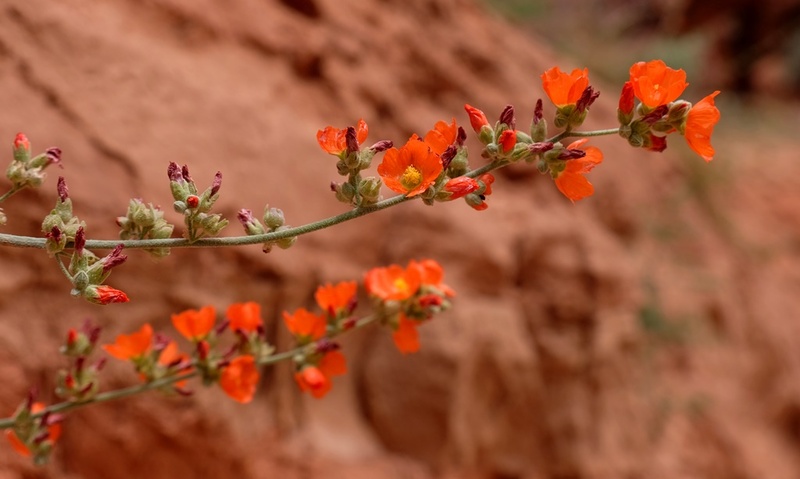 I had remembered the 1.7 mile hike from the trailhead through Wire Pass Canyon to Buckskin Gulch as an easy walk with only a few scrambles over boulders. 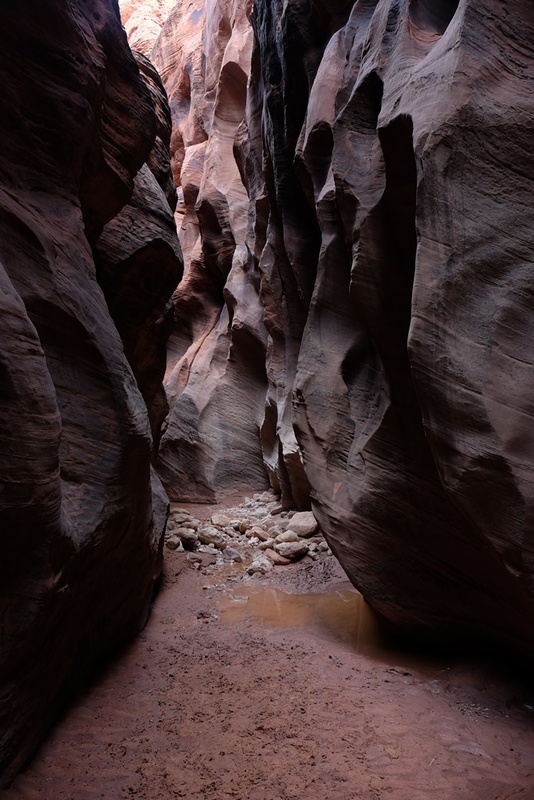 But things had changed a bit over the past couple of years and the floor of the canyon seemed lower and was much wetter. 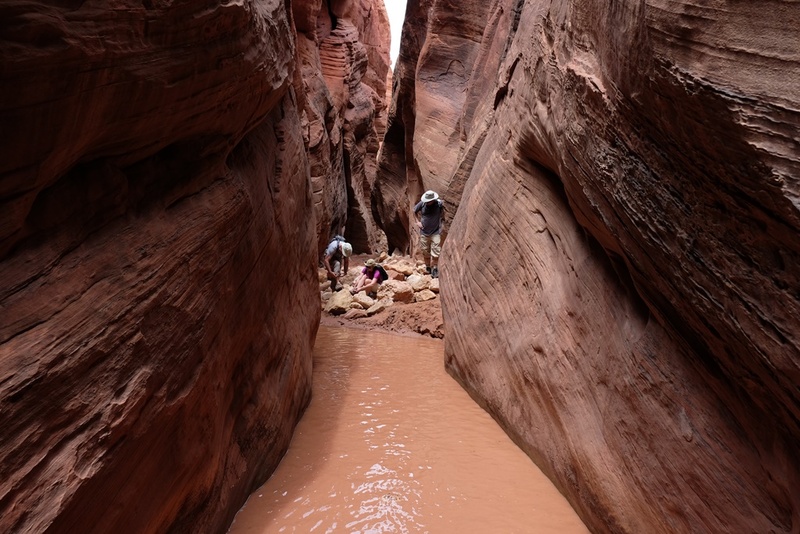 Hikers were struggling to get over the drops into the canyon and reluctant to get their feet wet. 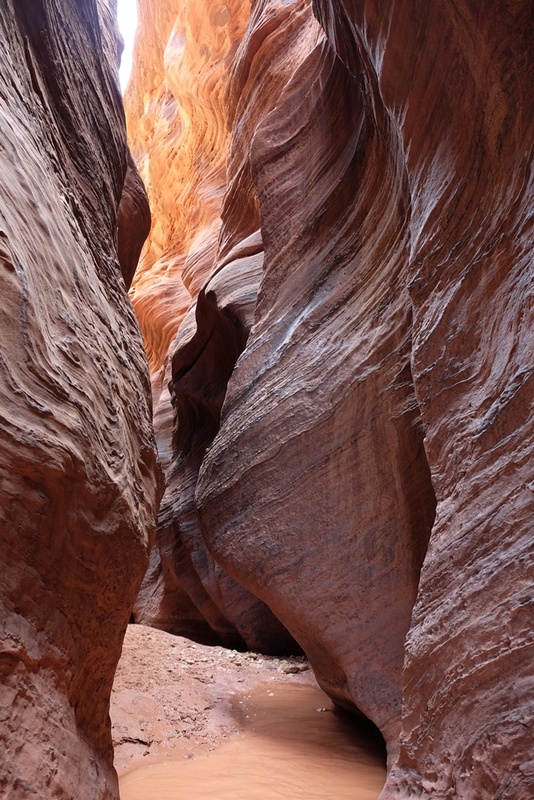 Several spots in the canyon became jammed with people, several of whom ultimately turned back. 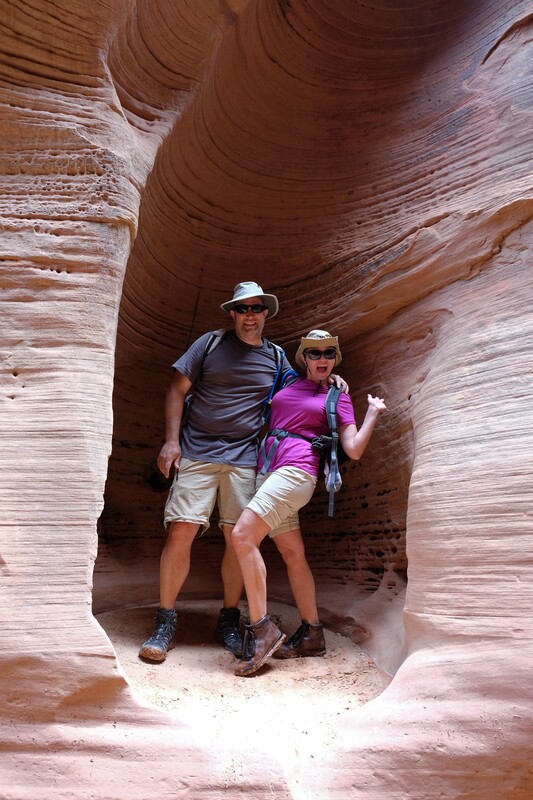 We forged ahead and eventually made it through Wire Pass and to the alcove near the confluence with Buckskin Gulch. 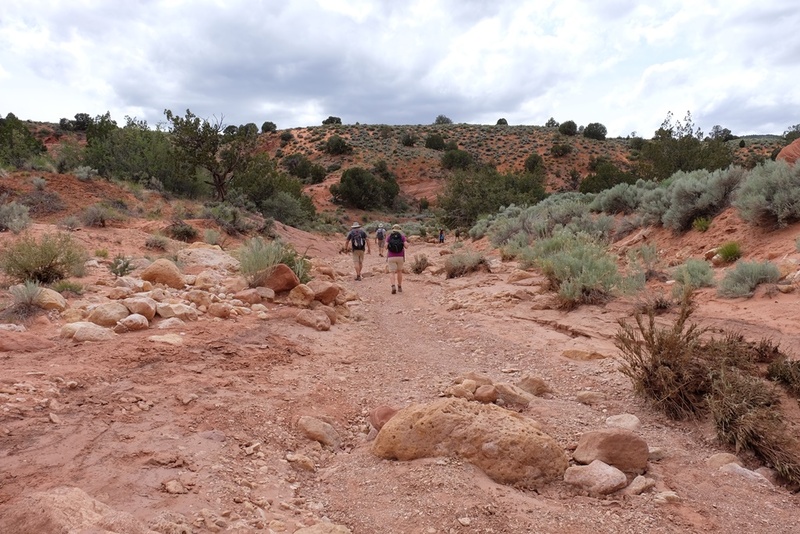 The rains had changed the Gulch as well, and we faced numerous deep, muddy puddles. Ultimately, the only thing to do was to wade in, boots and all, and so we did. It was slow going but fun. When we decided we had gone far enough (and thunder was beginning to rumble above us), we enjoyed a picnic lunch and turned back. 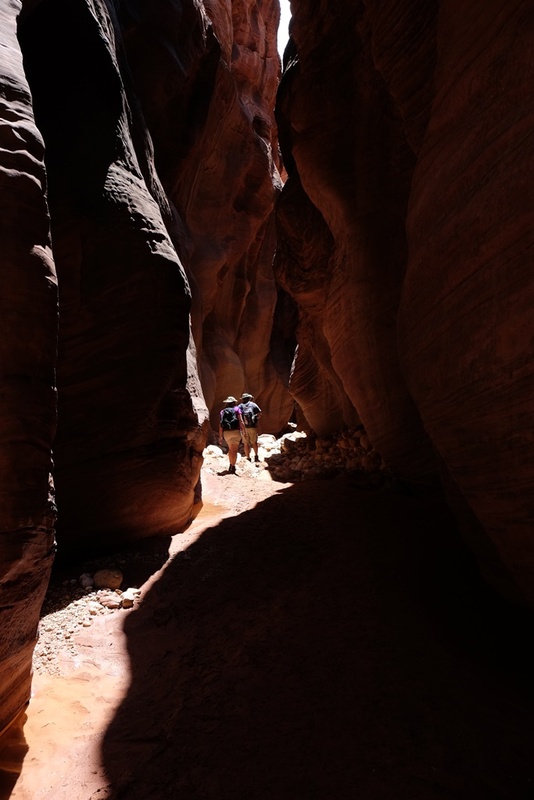 It definitely wasn’t the same experience I had before at Buckskin Gulch — much more difficult — but I am so glad we were able to introduce our friends to one of my favorite places! 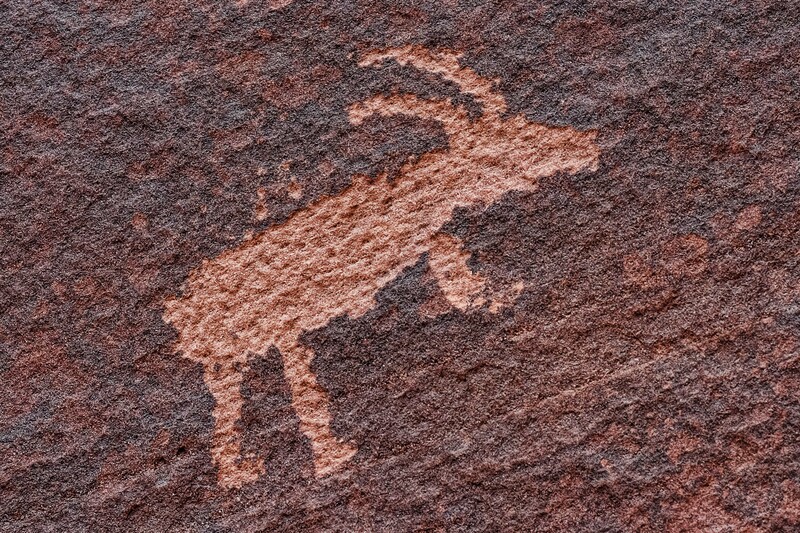 We were surprised to find a traffic jam in Wire Pass Canyon. There were a couple of drops that had deep water below and were difficult to negotiate. 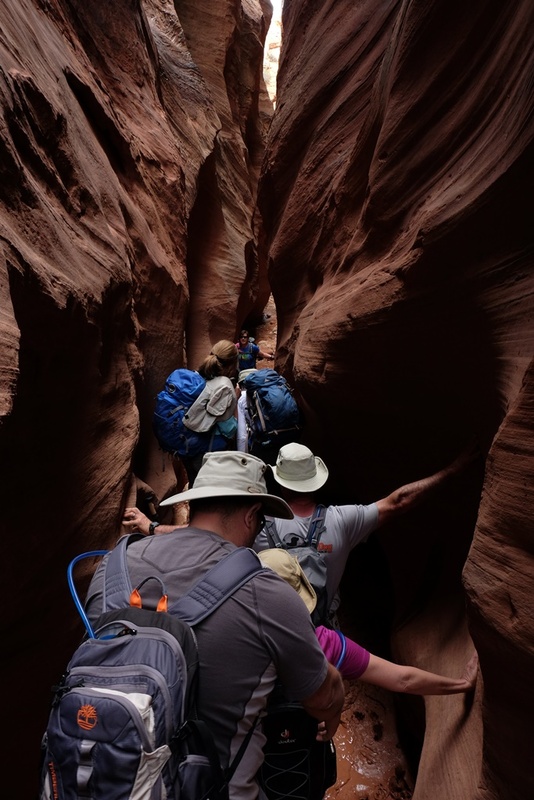 With a couple of groups trying to get into the canyon, it was a different situation than we encountered before. 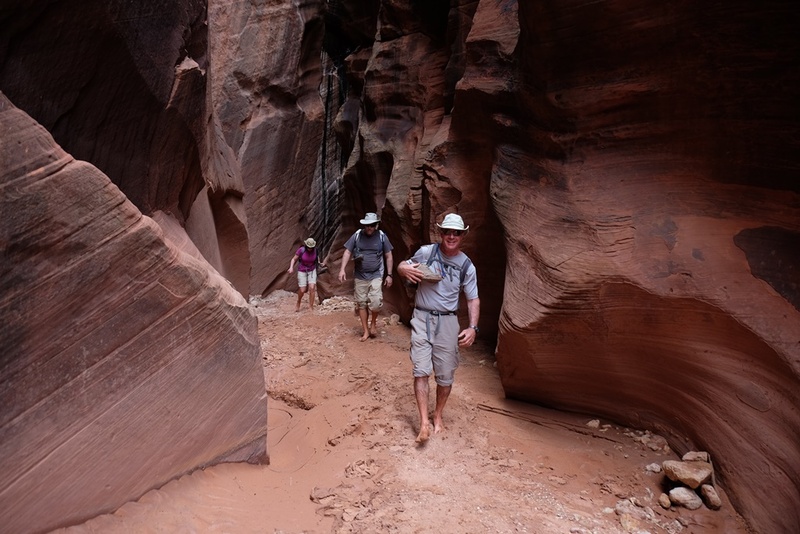 Ultimately we had to embrace having wet feet to continue into the canyon. Sorting out the footwear situation before attempting a deep water crossing. I had already gone through, boots and all. 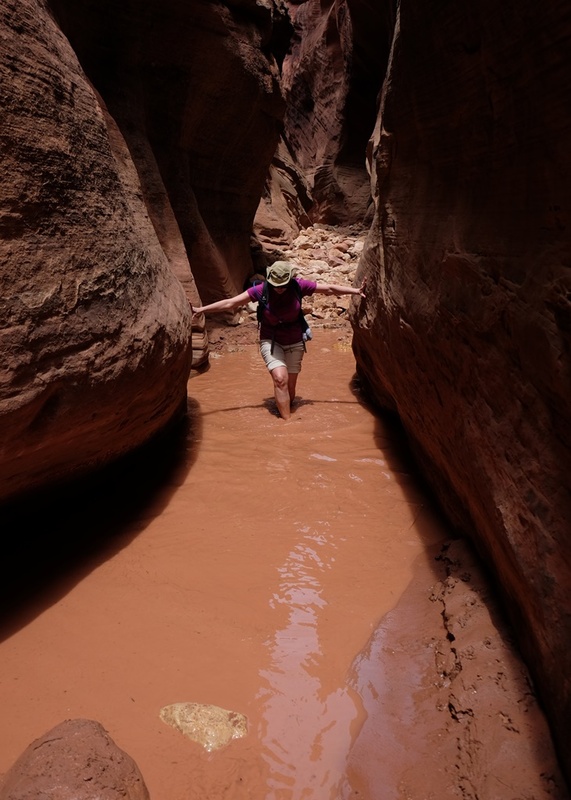 Laura stabilizing herself with the walls of the canyon while walking carefully through the cold, muddy water. 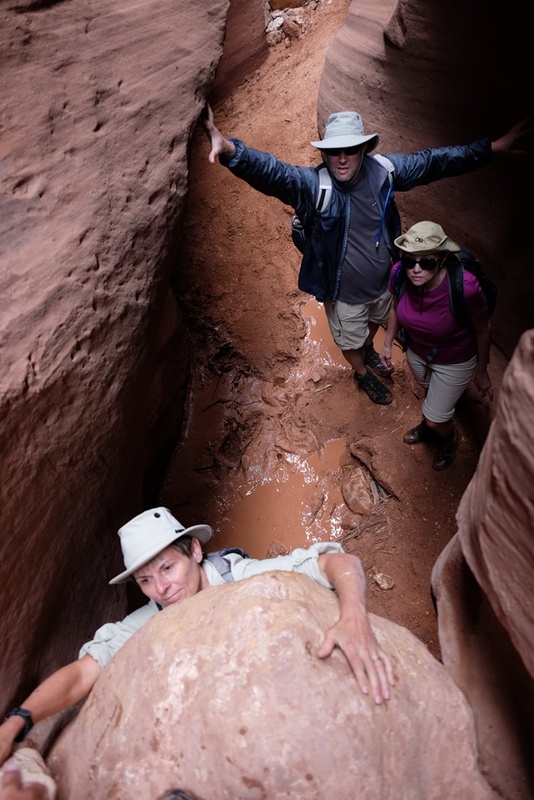 Getting out of the canyon was harder than it looked. I had to be hauled up over the rock I am grasping in this photo. 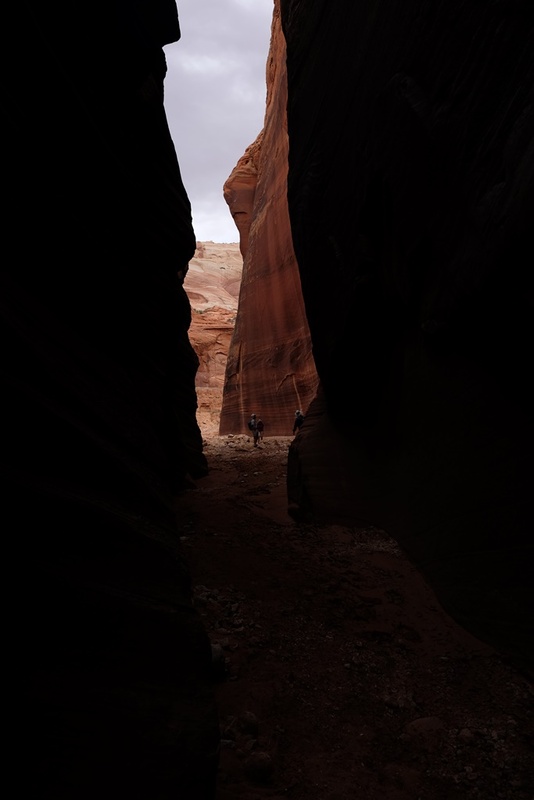 Some amazing shots Susan, the rock walls are so beautiful. Just imagine how many people have walked through there for generations!